This entry was posted in Auto Insurance, Car Safety Tips and tagged Auto Safety on 12/30/2015 by admin. Sometimes pedestrians forget motorists aren’t the only ones who have to put safety above all else when walking into an intersection. Needless to say, you’re much more vulnerable to injury when on foot than when sitting behind the wheel of a four thousand pound automobile. Still, you have to follow your own set of guidelines to avoid injury or worse. Unfortunately, pedestrians often do not pay adequate attention to traffic. The problem with taking the obvious for granted is that it can get you hurt. Assuming a car will stop simply because you have the so-called “right-of-way” and step out into the crosswalk could prove dangerous. A pedestrian can be a person on foot, on rollerblades or a skateboard, as well as someone with a disability, using a wheel chair. • Be aware of traffic conditions, especially at night when you may be hard to see. • Watch for hybrid and electric vehicles, which are almost silent in electric mode. You may not hear them approaching an intersection. • Always yield the right-of-way if you’re crossing a street where there is no crosswalk or signal. Making eye contact with an oncoming driver doesn’t mean he’s going to stop. • Don’t just step off the curb if a vehicle is close enough to possibly hit you should it not be able to stop in time. • Don’t let distractions, such as a cellphone or other electronic device, lead you into harm’s way. Stay focused or you could get hurt. • Obey traffic signals and crosswalk markings. They’re there for your safety. While drivers must always yield right-of-way to pedestrians, don’t always expect it. • When the signal first changes to green or “WALK” follow the street crossing instructions you learned as a kid. Look left, right, and then left again. • If the signal blinks, changes to the upraised hand or “DON’T WALK,” once you’ve started and gone part of the way, continue across the street without stopping. • Don’t anger drivers by stopping or delaying traffic flow deliberately while crossing a street. • Do not attempt to walk on a toll bridge or try to cross a major highway. Unless a sidewalk is present and signs are posted indicating pedestrian traffic is allowed, stay off. • In areas where there are no sidewalks, walk facing oncoming traffic. • Bike lanes are for bikes. They are not to be used for walking or jogging. 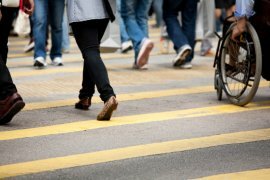 Your safety as a pedestrian depends a great deal on your constant awareness that potential dangers lurk at every street corner. Review these simple guidelines often and stay safe. While there’s no such thing as pedestrian insurance, chances are you also drive a car and a simple car insurance guideline that can save you money is making sure you’re getting the best auto insurance rates available. If you’re not sure – why not get a free auto insurance quote comparison today? Do you use extra caution when crossing intersections or jogging along busy streets? Feel free to share your thoughts in the comments section below.